The team here at Local Welcome is geographically spread and so it’s rare that we all get to work together in the same room. We get an awful lot done via video chat, but there are little things we miss out on by not physically being with each other, like the good vibes that happen when people who love what they do get together to create stuff. However, this week, we’ve had something of a revelation … Realtime Board is our New Favourite Thing. Picture this: Efe, our designer is in London, Celia our trainee designer is in Derby and me (Claire) our comms lead is in Nottingham - all of us are sitting at home on the kitchen table in front of our laptops. We’re coming off the back of a Sprint, with a million post-its’ worth of user testing analysis, primed and ready for our next iteration (iteration is techspeak for using what humans testing our service told us about their experience to improve it). 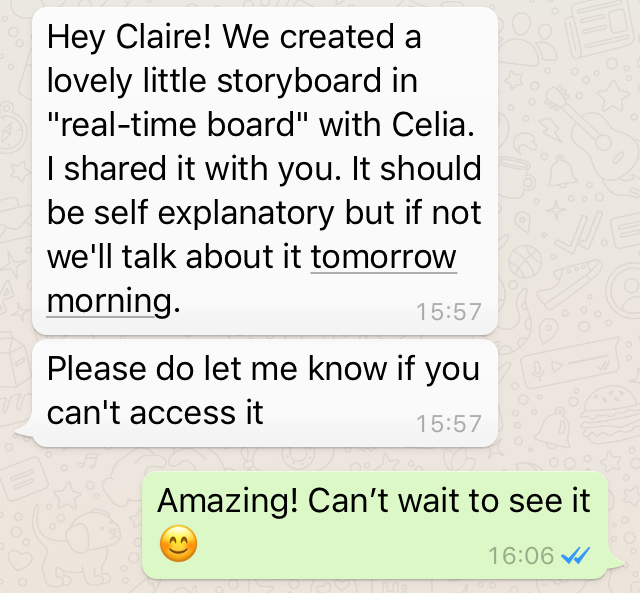 Accessing the board with the link Efe had emailed over to me and discovering the user journey storyboarding work he’d done with Celia was a really joyful experience. For starters, it looked lovely, as well as helping me to understand very quickly the work and thinking they’d done in my absence. With our user journey mapped out, our next step was to storyboard the video we planned to create as part of the new iteration. In the morning the three of us jumped on a video call but all our eyes were on the board as we pulled the frames, copy and images for the video together as a team. The storyboarding took about an hour and by the time we were done Efe and Celia were ready to crack on with the design for the video, knowing all of us knew exactly which direction we were heading in. Our clear brief plus Realtime’s planning templates not only helped us to have group clarity on direction of this iteration but also to speed up the process considerably. By the end of the day we were ready to demo. Would it feel as fun and engaging if we were all in the same room?